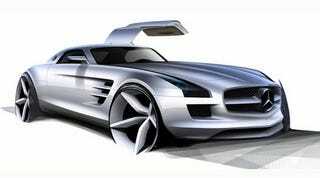 According to Autocar, development of the Mercedes SLS Gullwing eDrive is well underway. The magazine claims to have seen internal documents describing four electric motors making a combined 532 HP and 649 Lb-Ft of torque. The original Mercedes 300SL was ahead of its time, offering peerless luxury and extreme performance that outpaced 1950s competitors. An electric SLS could perform a similar feat, becoming the first zero-emissions supercar to be produced by a major manufacturer. Wolf Zimmerman, the engineer in charge of the vehicle's development, claims the SLS eDrive would accelerate to 62 MPH in less than four seconds and continue on to a top speed in excess of 120 MPH. Range will be between 93 and 112 miles depending on how it's driven. Front suspension is being swapped from upright double wishbone to pushrods with coilovers to accommodate electric motors sitting close to each of the wheels. Each 133 HP motor will drive its own wheel, effectively mimicking the performance of a torque vectoring all-wheel drive system. Off-the-line performance should compare favorably with the 571 HP, 479 Lb-Ft 6.2-liter V8 version, but the eDrive will obviously give up top speed to the gasoline-powered Mercedes SLS Gullwing.